Oh boy, I'm sure there must be an FBI file open on me now. Mr. Trump, I was recently in a debate with my good friend Bob Wenzel. I defended you against his unjustified attacks on your presidency. You might want to take a peek at it. For the record, the motion we debated was RESOLVED Is Donald Trump a Disaster for Libertarianism? I took the affirmative position. I have listened to your debate with Walter. Basically, according to Block, you are right in everything you say about Trump, but Trump is good because he is not Hillary. That's all he is really saying. to stand for more than 15 minutes at a time. Hillary, at this point in time, has nothing to do with Trump and libertarianism. This means, of course, supporting Presidents when they take positions in line liberty. President Trump rarely takes a position in line with liberty. However, I support Trump, for example, on his leaving the Paris Climate Accord. Dr. Block also mentions his leaving the Accord as a positive. But Block then hails the Trump nomination of Neil Gorsuch to the Supreme Court as a plus for Trump. But Gorsuch is an absolutely horrific choice. Gorsuch wrote a famous 2005 essay for National Review, where he hailed, get this, the judicial restraint of Supreme Court Justices 'in the face of great skepticism about the constitutionality of New Deal measures..."
And in the same essay, he said Congress had right "to experiment with economic and social policy." Can you imagine a Gorsuch Supreme Court vote under a Democratic Congress that wants to experiment with social and economic policy?! Trump has put an IED on the Supreme Court against limiting the power of government. This is not a small matter. And Walter thinks this is a positive! Walter then hails the appointment by Trump of Betsy De Vos to the Education Department. To be sure, she has ended some political correctness promoted by the DOE in the past, and she should be praised for that, but her big push is for horrific school vouchers. Here is Tom Woods on the problem with school vouchers. If American education is to have a future, it’s not through more government spending, control, and centralization. It is through increased local and private spending and control. The ideal is zero government involvement. Why does any freedom lover have to be reminded of that? Putting De Vos, when her day is spent advocating a horrific voucher system, as a positive Trump accomplishment just shows you how desperate libertarian Trump supporters are. I could go on and on complimenting you on your really wonderful achievements, but I am sure I have now established my “street cred” as a person hardly suffering from Trump Derangement Syndrome. I'll say Walter doesn't suffer from TDS! He suffers from mirror image TDS: Supporting Derranged Trump. This is a perfect example of SDT: Walter proclaiming the "wonderful achievements" of Trump. Increased the sanctions on Iran and refused to recertify Obama’s disastrous agreement with the nuke-hungry mullahs. Bombed a Syrian airfield and destroyed a fifth of Assad’s jet fighters. Rolled back Obama’s cringing concessions to Cuba. And I hasten to add that Trump plans to lower the engagement bar for nuclear attack! And he has nominated some terrible people for the Federal Reserve, including Marvin Goodfriend, who supports the use of negative interest rates, that is, a tax on consumer checking and savings accounts during a recession! So yes, Trump is terrible for libertarianism because, despite all this, some libertarians support Trump, especially some Rothbardians. Including Walter in his open letter to Trump where he soft-pedals the disaster Trump's first year has been for liberty. Wonderful? Trump has been a horror show. There are ways to go after political correctness and Jordan Peterson is doing a great job of showing us how this can be done but Trump crudeness and comments that make it unclear if he is dog whistling neo-Nazis is not exactly the best approach to attacking PC from an intellectual perspective. These Trump antics particularly turn off the young. Murray Rothbard in his unpublished strategy paper put heavy emphasis on attracting the young. Support for Trump is not going to get us the youth audience.Youth, however, will listen to anti-Trump commentary, right now that audience is being captured by the Left. If libertarians don't speak out against Trump, and there is no reason not to, we are going to lose the youth to socialists and lefty libwaps. And it will be particularly damaging to Rothbardians, since the left and lefty libwaps are trying to draw a line from David Duke to Pat Buchanan to Trump. This attempt could be completely countered by attacking Trump positions, which would completely destroy the Duke to Buchanan to Trump charge. So, no my attacks on Trump positions are not unjustified and they deserve aggressive airing. 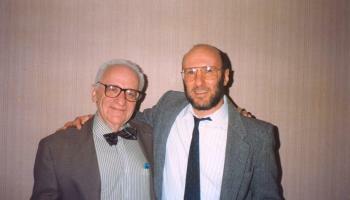 It's the least we can do for Murray Rothbard. I have a hunch that Block is tired of his ivory tower, and now he sees a Rothbard-Buchanan type of opportunity. What he fails to realise, even if the Trump camp somehow notices this shameless sucking up (very unlikely), he would be used and then discarded without a second of hesitation. In a previous comment, I said libertarianism is becoming a pipe dream, but this is straight up delusion. And I told you that libertarianism is a personal philosophy, not something to be imposed on others through political action. You're either a libertarian who lives by libertarian principles (consent, non-aggression, voluntary action) or you are not one. I'm not sure if we are in a semantic misunderstanding or you're just spewing pointless sophistry at me. Let's go with the first for now. Here's the thing: I'm not saying you are wrong. It absolutely is a personal philosophy, but if it's nothing else, there is no point to this website. If it's nothing else, then you are already living in a libertarian paradise - of one. Every time you attack somebody on borders, immigration, drugs, the warfare state, whatever, you are necessarily trying to impose your libertarian principles on them. Because you know, that even if you believe in all the right things, you live in a society that doesn't. But sure, that's just an argument about worldviews, not political action. But what about others? You can tout Rothbard or Paul or Block as intellectuals preaching about a way of life, you would be right. But all of them have/had political agendas, agendas that stemmed from their libertarian personal philosophies. You think ending the Fed is something that the general US population honestly wants? If by some miracle Ron Paul would have gotten elected and actually would have stuck with his principles, each and every one of his actions would have been an imposition of his libertarian values on a mostly unaware populace. What about Block? As I said, whatever game he thinks he's playing with Trump, it's bound to fail. But even if it didn't, the point would be to persuade Trump in a more libertarian direction, yes? The president of the USA, once again. Is that so he would tolerate Ivanka shooting heroin as long as she's not hurting anybody else? Or maybe to have Trump make the country more in the image of Block's libertarian ideas? I'm not arguing that anybody should play the politics game. If you live by your principles and happy about that, more power to you, I mean it. But there is a huge (or yuge, even) jump between you minding your own business and the whole of society doing the same. Making that jump is the goal of libertarianism as a political movement, and right now, that movement is failing. You can disagree, but to argue that this is somehow not the endpoint of libertarianism, to me, would be just spewing pointless sophistry. Point well taken, Mr. Peterson. The libertarian political movement has been a failure and that's because politics is not the answer. However, your statement: "It absolutely is a personal philosophy, but if it's nothing else, there is no point to this website" does not fully understand the value of a website like this. I get great pleasure reading ideas that agree with my own. It is psychologically comforting. A comfort that comes from knowing others who agree with the ideas of libertarianism and has nothing to do with "making that jump..." A jump that I believe is not possible by any human action. And so Mr. Torres' point that you are either a libertarian or you are not is also well taken. I offer the advice reportedly given by Voltaire to one of his friends: "Hide well to live well." My comment was getting ridiculously long as it was, but you have a point there. The company of like-minded people is a value in and of itself. I guess I'm just getting jaded these days. I really bought into the Ron Paul revolution in my formative years, even (or especially) as a European. It's hard to see it go so spectacularly wrong. I'm not afraid of the thought dying out, but it would be nice to see some changes for the better sometimes. Peterson, that's a great response to functional idiot Franco's usual libertardian stupidity. If you can't grasp culture and IQ and race matter, then you should not be a libertarian. I'm not actually happy about that. I don't even have a particular stance on the IQ or race questions. In my heart of hearts, I'm much closer to him than you in my political ideals, I would think. I certainly agree with Higgs when he writes about the dangers of an anti-immigration federal government in the other article. Still, I really don't see your points answered in any satisfactory manner. I would *love* to have an open border society that still moves in the direction of individual liberty. A movement that takes the high road at every turn and still accomplishes its goals. Maybe it is possible, maybe not, but calling you a racist (maybe you are, maybe not) is not a good enough refutation. If you want to perform that experiment, I want to place my bets on Silicon Valley winning that IQ test. Buchanan is not a Rothbardian. I don't care if libwaps or Martians trace a line from Stormfront to Buchanan. I used to like Buchanan and admired his intellectual view on politics but once he became a presidential candidate and started to showcase his economically-ignorant policies on foreign trade and his bigotry against immigrants, it was clear to me he was no libertarian. Rothbard also got tired of him rather quickly. There's an abyss between Buchanan's nativism and Ron Paul's principled libertarian and individualist views. I was upset and would still be upset if someone tried to tie white supremacists with Ron Paul's movement, but not Buchanan, certainly not with his preoccupation with the fate of people who lack melanin, of all things.